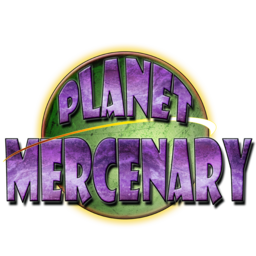 So, I picked up a game named "Planet Mercenary" last year, based off of Howard Tayler's extremely long-running Schlock Mercenary webcomic. I'm currently playing it with my IRL group, but we can meet maybe once or twice a month, and some months, can't meet at all, so I'm looking to expand things by running a game on Roll20.net. It's a pretty lightweight system. You pick a character background, a command package (your role in the company), and a Sophont type (basically your race, which range from Humans to some very alien beings), and then allocate skill points and buy gear. The system runs on D6-cubed, a proprietary system where the primary mechanism is 3d6 + rank, but with the introduction of quirks where some weapons benefit from doubles, triples, or straights, and where there's an odd-colored die called the Mayhem die. Whenever you roll for a check and succeed, and the Mayhem die is greater than the other two dice, you draw a Mayhem card. Mayhem is sometimes good, sometimes bad, sometimes neutral, but is very seldom boring. By it's nature, it's not a very good Play-by-Post game. Actions are resolved in "Speak first" order, which means there isn't a consistent initiative to work from. So I was thinking Roll20 would work well. I played a shakedown game not long after the product's release, including the great honor of having the game's designer, Alan Bahr, in on it. I think I can manage to explain things well enough to keep anyone from having to worry about buying the books, although they're well worth the buy, if for no other reason than the insight you get into Tayler's invented universe. So, who might be up for some mercenary adventure? I'll be up to it, but the question that begs being asked is how committed are you going to be with the game? ^_^ For running a few sessions as a real-time thing in the evening? That I can do. It's the more longterm planning that I get choked up on. Sorry if I came out to harsh my friend, not my intention, I knew you were dealing with personal things and I meant it as a concerned by your well-being comment, not a recrimination. No worries. It was a reasonable thing to ask. Let me know if I can answer any of your questions. There are actually some pre-gen characters available at https://www.planetmercenary.com/assets/ ... regens.pdf if you'd like a quick idea of what a typical starting character looks like. looking closely int it i think i had misunderstood and thought you wanted to make it play by post, but you want to hold live sessions right? Ah. Yes, via Roll20. I'm currently working at importing the Mayhem deck. No worries. I've generally avoided it myself. This is a special case where the system just doesn't tend to work well in Play-By-Post.